For Central Saint Martins graduate John Alexander Skelton, sustainability needs to be integral to the lexicon of fashion. The young designer calls for urgent change within the industry, and he’s starting with his own practice. Through his work – like his recent MA collection – Skelton strives to raise awareness on the polluting impact the industry has on the environment, tackling fashion’s carbon footprint by using local resources, repurposed materials and 100 per cent eco-friendly means of production. Skelton’s prize-winning graduate collection was inspired by the ‘Mass Observation’ survey, which began in 1936 and was a sociological and anthropological questionnaire rooted in surrealism. The aim of the survey was to find out the mood and the feelings of the working class, specifically of people living in the industrial town of Bolton in northern England. Interested in the relationship between the observed and the observers, the survey also inspired Skelton’s collection via the flamboyant silhouettes of the surrealists and the raw materiality of their clothes. Here, he recalls his journey into fashion, the research behind his work and how he ended up getting Stephen Jones on board with his graduate collection. Where are you from and how did you get into fashion? John Alexander Skelton: I was born in York and grew up there with my two younger brothers Danny and Ryan. We lived in a fairly suburban area, very close to the countryside and our house was built on an old airfield, which is still mostly present. Growing up it was a good place to run wild, I spent all my time outdoors and was not particularly interested in academia until later on. I was always interested in clothes and dressing myself in a particular style from a very early age. I didn’t associate what I was doing with fashion at all but rather was motivated by music and culture. My mother was an undeniable influence on my brothers and me, she constantly asked our opinion on what she wore and she understood the importance of dressing well and with personality. What was the wider inspiration behind your graduate collection? John Alexander Skelton: I have an extensive interest in the sociopolitical and the effect it has on fashion and culture within specific contexts and vice versa. I’m also obsessed with the concept of class, past and present. I’m fascinated by how clothing can be and has been a social signifier, how it can also represent a culture and what happens when one can influence another due to shifts in society, whether it’s detrimental or positive. You’ve been merited for the extensive research you carried out for your final collection, what areas did you explore? John Alexander Skelton: The starting point for this collection was the ‘Mass Observation’ survey, which began in Bolton in 1936. The mundane aspects and the minutiae of the mill workers’ lives created an unparalleled archive of a place in time bounded by the social, the political and the economic. I looked deeper into the interplay between the observer and the observed, translating the links and tensions into the collection and exploring the sartorial transitions individuals undertook to set themselves apart by using whatever materials or techniques were to hand. I also came across a statistic that only three per cent of the wool woven in Britain was from British fleece, which spurred me into finding out why this was the case and whether it is something that could change to reduce the carbon footprint that is created by imports of fleece from Australia and New Zealand. I found yarn being produced from British fleece, which sadly is one of the only spinners of its kind left in the country, then a mill that would weave it for me to my specification. The knitwear in the collection also utilises British knitting yarn, which comes from breeds of British sheep that are thousands of years old. Shirting and other wools in the collection were handwoven, handspun and importantly sustainable and eco-friendly from sources that are not the easiest to come by. A collection which is entirely sustainable and non-compromising aesthetically requires long hours of research and is often why people give up at the first hurdle. Stephen Jones worked on the collection’s hats – how did you get him on board? John Alexander Skelton: I knew from my research that I wanted to do some form of hat for the collection, one of the notes from ‘Mass Observation’ was that hats in Bolton acted as strong social signifiers. For example, the most basic worker would wear a cloth cap, then up from that would be a trilby, and the foreman or equivalent would wear a bowler. In a discussion with my tutor Fabio, I asked if he knew of a milliner that would be good to work with and he immediately suggested Stephen, which was a surprise. I went to meet him one rainy morning, we got on well and after a chat about my collection we filtered through ideas essentially breaking down the essence of the collection. The aim was to create a hat that would be apt for the look, rather than hats that try to lift a look to make it something else. It was all about a sense of rigour and purpose, hence the hat in the collection which you can carry your sandwich to work in. 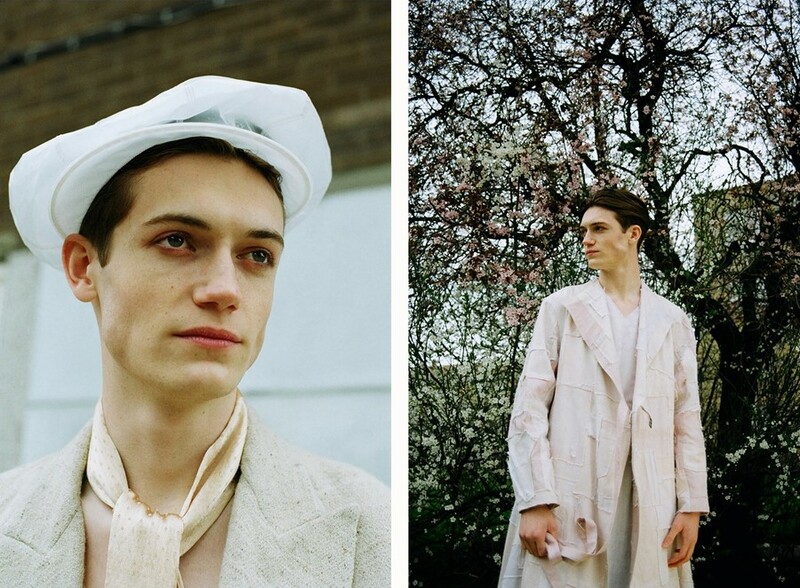 Stephen was also inspired by my very personal use of repurposed fabrics such as my grandmothers’ old bedsheet and used unusual but everyday materials to execute the hats, echoing a shared sense of a refined eccentricity. Why is sustainability in fashion important? John Alexander Skelton: Fashion is the second largest polluter in the world behind oil, need I say more? I think it’s about educating people, especially young designers to then influence the big conglomerates of this industry. The rumour that those who work in fashion are not especially intelligent is a definitive truth, ignorance is prevalent and almost commonplace. I want it to be taken as a given that my work is sustainable, regardless of what it takes to conceive it. Also, sustainability shouldn’t be used as a marketing scheme to make more profit from the guilt-ridden consumers. Why is fashion an appropriate tool to comment on wider issues? John Alexander Skelton: It’s intrinsically part of wider issues from the get-go, so to use it as a tool to comment can only be a natural step and without sparing a thought as to whether it’s appropriate. Especially at the point fashion is at now the visibility it has worldwide has such an enormous power to be able to change. The gag and harness come in the form of sales, profit and revenue – a combination of greed and irreverence – which leads to the vapid collections that are so commonplace and often unquestioned.